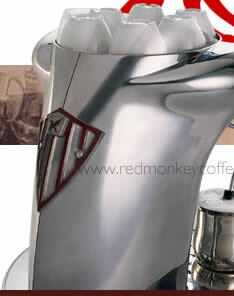 Elektra UK Nivola Espresso Coffee Machines Retro Styled Coffee Maker - Red Monkey Coffee UK. Free UK Delivery. Order the Nivola online now. Call 0870 207 4831 or email to order models below. Out of stock until Mid December, order now to reserve your machine for delivery before Christmas!! In Stock. Limited stock, when they are gone, the next stock will not be until Mid December as above. 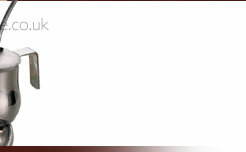 Click the add one graphic & the quantity will appear in the box - any problems call 0870 207 4831 or email. GROUND Only	- The classic model for those who love the rite of making coffee - designed to operate with traditional ground coffee, using ground coffee can be more messy than PODs and your skill will determin the output. POD Only	- The pod model, with fewer and easier operations easier cleaning and no doubts over grinding, cup measures and tamping/pressing, you are limited by the amount of coffees available. Note: That we can get a kit to convert the ground version to PODs, there currently isnt a kit to convert POD to ground but it could be done by sending it to the engineers for converting your machine at a later date at a cost. 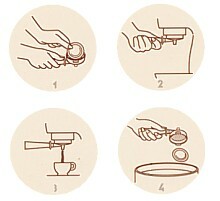 Expert barman quality in the simplest way. Elektra Nivola® is a machine that has been designed to produce an excellent quality coffee at all times, even without any particular experience. A special technology makes it foolproof. If, for example, the water is not hot enough to prepare a good coffee or the steam pressure of the cappuccino maker is not yet at optimum temperature and pressure level, Elektra Nivola® goes into the stand-by stage. It only starts operating, a few seconds later, when ideal conditions have been reached. If there is no water in the tank, a warning is given before any damage can be caused. In this case Nivola® stops all functions until the tank is filled. Speed, the bright gleam of metal, streamlined forms that offer little resistance to the wind were the signs of modernity in the thirties. 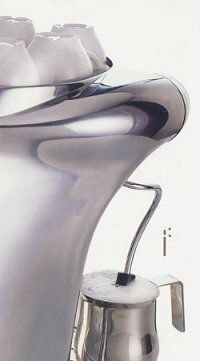 The creativity which generated the streamlined design of Elektra Nivola® incorporates the artistic and cultural influence of currents of thought that from futurism led to italian "Bolidism". An American movement in particular used them to revolitionize the way of designing everyday objects and machines: it was called Streamlining and had the merit of not only making the shapes of many industrial product more aesthetic and pleasing, but also inaugurated a new relationship between machine and man. It was the start of attention being paid to ease of use and practicality; in one world - ergonomics. Materials selected for their qualities of strength and durability, always in line with the quality level of the design: these are the finishing touch for a refined, sophisticated design. 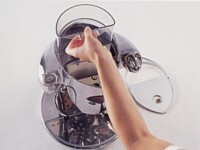 The Elektra Nivola housing is in mirror-finish polished aluminium complete with a Plexiglass cup-covering dome. The grids are in non-corrosive stainless steel, the boiler unit and the filter holder are in brass, while the filter holder grip is in authentic Bakelite. This is not just retro styled, this is made with real retro materials in a true retro design, superb. A few movements and intuitive mechanisms. Simplicity is the first secret of Nivola®'s technological perfections. 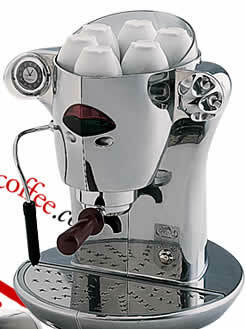 Just one ergonimic aluminium knob controls the "coffee" and "cappuccino" functions. The lights, in a highly attractive layout show that the machine is switched on or needs water or is in the stand-by stage. 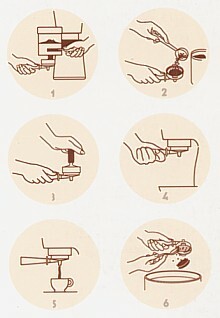 The lower drip tray can be removed. 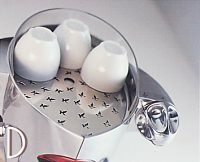 The stainless steel cup grid is embellished by the Elektra logo. The finishing a esthetic touch is a useful quarz clock that may be easily remove to adjust the time and replace the battery. - Very easy to fill. Just raise the cup-heating grid plate and pour water into the tank. The tank may be easily taken out.